U.S. strategic military satellites are vulnerable to attack in a future space war and the Pentagon is considering a major shift to smaller satellites in response, the commander of the Air Force Space Command said Tuesday. Gen. William Shelton said in a speech that China currently has a missile that can destroy U.S. satellites and warned that the threat of both space weapons and high-speed orbiting debris is growing. The threat of attack to large communications and intelligence satellites is prompting a major study on whether to diversify the current satellite arsenal of scores of orbiters. 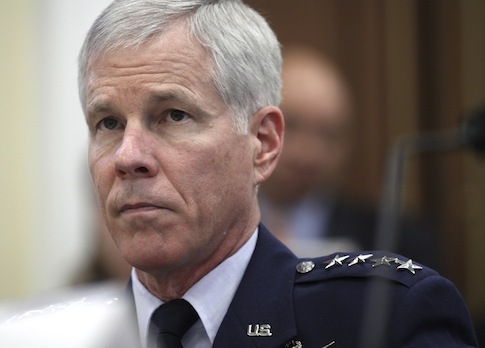 The four-star general also said he is wary of the United States joining an international code of conduct for space, an initiative promoted by former Secretary of State Hillary Clinton. The code likely would constrain the United States’ freedom of action in the increasingly contested realm of space, he said during remarks at George Washington University. Over the past several decades, satellites have revolutionized war fighting and caused a shift in the character of military forces from large ground armies to forces that emphasize agility and speed. Shelton said the United States’ highest priority military satellites are those that provide survivable communications and missile warning. Current systems cost about $1 billion each. If any of these critical satellites are attacked and destroyed in a conflict or crisis, the loss "would create a huge hole in our capability" to conduct modern, high-tech warfare, Shelton said. "Space has become contested in all orbits, where we face a host of man-made threats that may deny, degrade, or disrupt our capabilities," Shelton said, noting electronic jamming, laser attacks and "direct attack weapons," which are all systems being developed by China’s military. Jamming satellites is "a cheap and effective way of blocking our signals from space" and lasers "can blind our imaging systems, and in the future, they could prove destructive to our satellites," he said. "Direct attack weapons, like the Chinese anti-satellite system, can destroy our space systems," Shelton said. China’s successful landing of a robot rover on the moon last month revealed "an aggressive Chinese space program," Shelton said. China is also building anti-satellite weapons that range from ground-launched missiles that destroy orbiting satellites, ground-based lasers, electronic jammers, and cyber attacks, according to defense officials. The latest annual report of the congressional U.S.-China Economic and Security Review Commission stated that China recently conducted a test of a high-earth orbit anti-satellite missile. The test signaled "China’s intent to develop an [anti-satellite] capability to target satellites in an altitude range that includes U.S. Global Positioning System (GPS) and many U.S. military and intelligence satellites," the report said. The Free Beacon first reported the test. Defense officials also disclosed in January 2013 that China launched three small maneuvering satellites as part of its ASAT program, including one with a robotic arm that can be used to capture or destroy orbiting satellites. Shelton said he favors better communication with the Chinese military on its space warfare efforts and that recent exchanges are encouraging and could avert a future military "miscalculation" in space. "Miscalculation is one of the biggest threats we face," he said. China has repeatedly rebuffed U.S. government efforts to engage in discussions on space weapons and warfare, among the Chinese military’s most secret programs. "Like the old Billy Joel song says, we didn't start the fire, but we're certainly in it, and it would be irresponsible for us, irresponsible at a minimum, not to protect ourselves," he said. To better protect satellites in a future conflict, the military is currently studying new ways of replacing or restructuring satellite systems, along with better methods to dissuade and deter enemies from attacking them. The policy of loading large satellites with numerous types of sensors and missions worked well in the past. But in the new contested space environment, a new strategy and architecture are needed, Shelton said. One new strategy advocated by the general calls for "architectural alternatives" that are currently being studied by both military and industry. The new focus calls for shifting away from large, multiple-payload satellites in favor of a larger number of smaller and simpler systems, which would be less expensive and conform to the currently tight defense budgets. "By distributing our space payloads across multiple satellite platforms, we increase our resiliency to the cheap shot or premature failure," Shelton said. "At a minimum, it complicates our adversaries' targeting calculus." A new system of "disaggregation" also calls for new satellite operating methods. In one recent experiment, the military equipped commercial communications satellites with a missile-warning sensor. Shelton said the test was "very successful." Bureaucratic opposition in government and industry to a smaller, diversified satellite structure can be expected. But Shelton warned: "Now, I'm not a fan of waiting for a catastrophe to propel change. The signs of a radically different space environment are all there. We just have to pay attention to them." America’s enemies have been studying U.S. war fighting efforts in the past several decades and are "going to school on us," Shelton said, specifically the revolutionary way the U.S. military uses satellites to integrate information assets in combat. He compared the current threat of space warfare to the beginning of the space flight age in the 1960s. "Just as the start of space flight signaled a fundamental shift in military operations, in my mind, so does this new era of challenging another nation's space assets," he said. "Sad, but true, in every medium, mankind has found a way to make it a medium of conflict. Land, sea, undersea, air and now space and cyber." The growing threats to space, now crowded with around 1,000 active satellites and 23,000 pieces of space debris, has increased the need for closer space intelligence and surveillance, currently based on radar and optical sensors at ground stations around the world and a dedicated satellites orbiting 23,000 miles in space to track things in high-earth orbit. "Keeping a constant eye on space and the activity that's going on there is vital to our national security," Shelton said, noting over 60 nations have a financial stake in at least one satellite and 11 countries have space launch capabilities. Shelton said all nations have a right to access space but U.S. policy calls for opposition to "aggressive behavior and debris creation." "We believe in freedom of navigation and freedom of maneuver and we will constantly work to maintain both," he said. On the space code of conduct, Shelton said he favors the concept but is concerned that an international accord would "unnecessarily constrain us." "We believe in freedom of action and freedom of maneuver in space," he said. "If we have gotten to the place with a code of conduct that it ties our hands in some way with what we need to do to accomplish national security objectives, I think that's problematic." Also, verifying a space agreement would require honest participants, he said. The Obama administration announced in 2012 that it was considering joining the European Union in formal talks on the code, which has been promoted by Russia and China. The Pentagon’s Joint Staff in an assessment of the code of conduct warned at that time it would constrain U.S. military operations in space. "Just simple calculation: My search volume, if you will, of what I'm responsible for protecting is 73 trillion cubic miles, geosynchronous orbit to the surface of the earth. Think about trying to monitor the activity in that vast space and making sure nobody's doing anything to violate either that code of conduct or the treaty or whatever it is you've come up with in terms of an international agreement," Shelton said. "We have to think this through, and I guess I put myself in the realist class instead of the idealist class," he said. "And if it doesn't have reality to it, I'm not sure it's got a whole lot of value." On deterring space warfare and dissuading states from waging it, Shelton said both subjects are a concern. "How does the United States deter activity against its space capability? How does it dissuade nefarious actions in space? How does it dissuade people even building systems that provide that capability to potential adversaries?" "To me that is a tremendous challenge because if you look at traditional deterrence theory and try to apply that to space, part of it works, but a big part of it doesn't work at all." Developing the most powerful U.S. space weapons to deter adversaries may not be useful for deterrence and dissuasion, he said. Nuclear war deterrence theory during the Cold War would be very different when applied to both the space and cyber domains, Shelton said. China military affairs expert Richard Fisher said Shelton’s emphasis on "disaggregation" of strategic satellites relies on passive defenses. China, on the other hand, is building active, offensive space warfare capabilities. "The United States also needs to develop its own active military space systems to deter China," Fisher said. "The U.S.needs multiple anti-satellite systems, that can be launched from ground, naval, and air platforms." To counter any U.S. attempts to make strategic satellites more resilient, China is investing in micro and ultra-small satellites, Fisher said, noting that China’s entire space program is run by the People’s Liberation Army. This entry was posted in National Security and tagged China, Military. Bookmark the permalink.